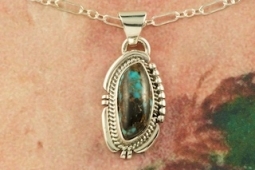 Genuine Candelaria Turquoise set in Sterling Silver Pendant. 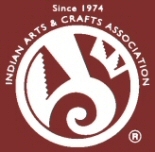 Created by Navajo Artist Evelyn Yazzie. Signed by the artist. Free 18 inch Sterling Silver Chain with purchase of pendant. Candelaria Turquoise comes from the large Candelaria Silver and Gold mine in Nevada in an area not to far from Tonopah. It is currently closed with no mining activity and as such Candelaria turquoise is rare and considered a collectable. The turquoise in this area was usually found in thin veins and is known for its beautiful almost electric blue stones, sometimes with a light matrix. Over the last few years Candelaria turquoise has been seen again in today's turquoise market from older collections with beautiful dark blue stones with a beautiful matrix pattern and has now been cut and is appearing in fine jewelry. This mine produces some of the most unusual and beautiful patterns, no two stones are ever alike. Pendant is 1 1/8" L including bale x 1/2" W.